With all the excitement about the upcoming 3DS and all the amazing titles lined up for it – again, Contra is coming – let's just take a moment to remind ourselves that the Wii is still very much alive and kicking. Nintendo has kindly put out a release schedule for the machine but those expecting to find hidden treasures may be disappointed, though that's not to say the list is lacking in quality titles. With few, if any surprise games announced for the Wii it's no shock that the schedule isn't rivalling that of the 3DS in the wow factor, but you'll notice a wide range of titles for young children and those who love TV shows but are unable to get on them for real. There's also something to meet both groups, with a ream of Sesame Street games on the way, but the big names are all from the Nintendo stable: Zelda, Kirby and Donkey Kong. Kirby is gonna be the best Wii game I hope! And a TRON game on Wii? Hope it ends up well. Nintendo without questioned won E3 2010 the titles are in a way to much (but that's what makes E3 special). Other M looks better every time I see something new. Kirby looks like great fun. Great to see DK back on form. So, yeah, the Wii got overshadowed, but its definately got a strong lineup. Plus, all I need is Kirby and Donkey Kong. @Prosody the ds had a worse one with only a few titles. Can't wait for IVY THE KIWI!!!! i suppose with all of the excitement around the 3DS, the wii is going to look pale in comparison. especialy as quite a few of the upcoming wii games have already been anounced over the past few weeks. srill, bring on DKC, that`s what i`m waiting for. I'm COMPLETELY satisfied with the wii lineup. The wii lineup is not very good. Its mostly stuff we knew about and anything we didn't know about doesn't look all that great. Some pretty good first party games but barely anything 3rd party. They had been having strong 3rd party support but now it looks like I need to get a ps3. As excited as I am about 3DS, Zelda, DKCR, Goldeneye, Epic Mickey and Kirby (and I'm totally psyched! ), I still felt my yearly twinge of sadness when Pikmin failed to show up. Don't worry Captain Olimar, I still remember you! I think this is a great lineup honestly. It was just overshadowed by the 3DS lineup, which is completely insane. Kirby Epic Yarn, IMO, looks amazing. Donkey Kong Country Returns looks great, then of course there's Zelda and all the 3rd party titles, like NBA Jam and Goldeneye. Also, Nintendo's holiday lineup for Wii is looking good. Kirby, Donkey Kong, that Flingsmash game that wasn't even mentioned, and Wii Party, which at least has a decent chance of being good (probably not fantastic though). what are you talking about? Keeping the shovelware out, This is list is better than last year with lots of great games. The 3DS hype makes it look different but don't forget that the machine won't be released until next year and not all the games announced may be released on day 1. Where is the Ubisoft lineup? Most of their games have Wii-centric versions on the way: Driver: San Francisco, Ghost Recon, Shaun White, HAWX 2, and Raving Rabbids Travel in Time all seem to have potential, especially for Wii only owners. Yeah, I don't know what someone is talking about, trying to say the Wii line-up looks bad through the rest of the year. I just clicked over and read down the list, and found myself thinking: "I want that...and that...that looks good...that's going to be great...another one I want.." etc. The list is strong from both first and third parties. No, there's no Bulletstorm, but...you know what? What I see in that list suits me fine because it looks like FUN for a lot of things. Heck, I'm even interested in Jeopardy and Wheel of Fortune since they are reported to use Wii Speak and voice recognition so you can call out the answers! How much better for a game show can you get? From the top of the list to the bottom, and from almost every publisher on it, there are games I want to get. And this is just ONE console. I think if I owned anything other than the Wii I'd NEVER have any money. The Wii line-up suits me just fine through the rest of the year. For me, this year is ALL about the Wii. 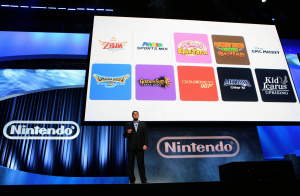 Iwata: Ok, so what titles should we have for 2010-2011? Employee: Um, we're sort of out of ideas, can we sequel Wii Sports again? Iwata: I dunno, it's a little too soon, plus we've been getting criticism that all people buy on Wii is Wii Sports. Employee: Uh, how 'bout we just put Mario in it instead? We can call it...uh...Mario Sports. Iwata: Done, people buy Mario almost as much as Wii-games. What else. Employee: We haven't done anything with Mario Party in a while. Iwata: Yeah, but the last Mario Party on Wii sucked, and we already have a new game with Mario's IP needlessly tacked on. Iwata: Perfect. Nintendo, all the looking like doing something different, without all the actual work in doing something different. Not complaining, they've bringing back a lot of their great secondary IPs this year with DK and Kirby, and you can't forget teh awesomeness of Zelda plus all the in house time they've spent on 3DS. Lots of titles, at any rate, so there won't be any vacant spots in their release schedule. Um. 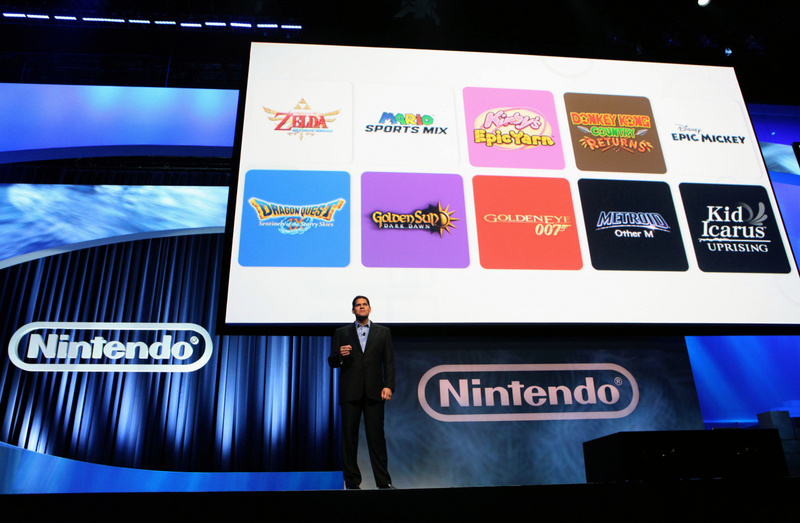 Nintendo has a KILLER lineup for the Wii. The other companies? Not so much. But never mind, I don´t have time to play more than a handfull of games anyway. I think I found enough games in that line-up to keep me occupied for another year. Most of them are Nintendo games, but NBA JAM is highly anticipated for me, and so is the Batman game. And hopefully games like Epic Mickey and Sonic Colours turn out well. The lineup is OK, but they could concentrate on the hardware side. I would like to have an Wii upscaler, to play these games in at least 720p. That would be really amazing. I wonder if they'll announce the big Doshin the Giant sequel next year.